Elevate your senses with Mineral Mountain Zipline! With Mineral Mountain Zipline take flight on the joyride of a lifetime in the Columbia Valley as you glide effortlessly through forest canopies and across Fairmont Creek on the picturesque Mineral Mountain Ziplines course. Nestled at the foot of the Rocky Mountains, our course features six mind-blowing lines that provide a thrilling combination of speed, height and distance. 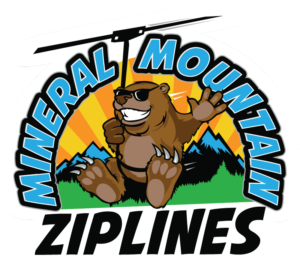 Mineral Mountain Zipline is Open May through October! At Mineral Mountain Ziplines, the vision is to create an adrenaline zipline adventure that heightens the senses and reconnects guests with the magnificent natural surroundings of the Columbia Valley. From imposing mountain headwalls to quirky hoodoos, there’ll be no shortage of things to marvel at as you zigzag across Fairmont Creek from high above. By partnering with Fairmont Hot Springs Resort, Mineral Mountain Ziplilne provides the perfect launch point for your zipline adventure. Renowned as one of the top tourist attractions in BC, there’s so much to do in the area for the entire family! Your safety is top priority at Mineral Mountain Zipline. From the time you sit down for your initial safety orientation to the time your guide unclips you from the last of our six grin-inducing ziplines, your well-being is foremost in our minds. To achieve this, they provide two experienced guides for every adventure tour that goes out on the course. Furthermore, our rugged body harnesses and helmets can be adapted to a range of body types and sizes, ensuring a proper fit every time. Lastly, their zipline towers and platforms are engineered to be completely safe, stable and user-friendly, providing a tour experience that’s both hands-free and worry-free.